On November 15, more than 250 students at GHS gathered for an optional assembly to learn more about the risks and consequences of vaping. Over the past few years, the rates of vaping among teens has skyrocketed to epidemic proportions. Experts are now saying that the rise of vaping has undone more than 50 years of public health work. The idea for this forum came about at our GHS Youth Forum table where adults and students come together to talk about issues that are important to our teens. The prominence of vaping was one such topic and the idea for this forum came about from the conversation. 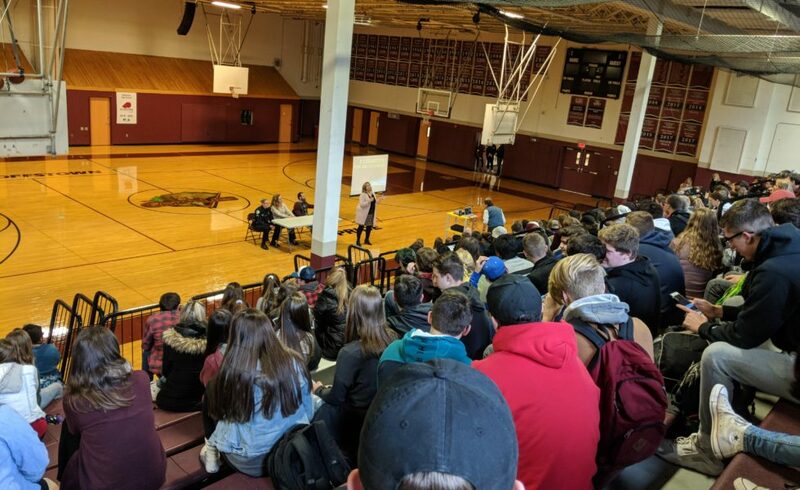 During the forum, a brief presentation by expert Laurie Warnock of NNEPC was followed by our own local experts, Dean of Students Todd Lavallee, SRO Jackie Pelletier and SAP Shannon Hebert who each shared information and answered questions from those in attendance. All in all, it was a very successful assembly and one more cog in the wheel steering our kids towards a healthier future.